Bottom line up front, this book is a good read and I particularly enjoyed it because Benerson Little is a man after my own heart. Little is an ex Navy Seal so the military connection also means that I am biased towards him at the outset and I think Black Sails picked an excellent advisor when they chose him. His passion for the subject is very clear and his search for information takes him through all kinds of excellent and diverse sources. One of the first things I do whenever I read any historical book is immediately turn to the bibliography. I knew I was in for an entertaining time and that I would learn something regardless if Little were a talented writer or not because in his Appendices, notes and bibliography he was meticulous and searched deep from some very good archival material both first hand and secondary. Mr. Little is like a painter who is covering his canvas with rich colorful detail that one would have seen in person if they had lived in “the Buccaneer’s Realm” of that time (the Caribbean during the last decades of the 17th century). I really love and appreciate this. In fact if I could describe Little’s writing style, it would be that of an artist. This book is not laid out in any kind of general or concise chronology. Instead the author chooses to provide layer upon layer of germane information to better illustrate his canvas – and the facts are deep – from the people and places, natives, antagonists and protagonists, backdrops, slaves, ships, weapons, religion and beliefs, etc… Little also writes a lot like I do and doesn’t necessarily document every single thing as he goes. This is something he is criticized for by other reviewers but I say – merely look at his sources and find the information yourself. I say this with a grain of salt because I was frustrated several times when the only note reference for the anecdote was a secondary resource which I don’t have – and now I must find that secondary resource in order to uncover the primary resource it was originally taken from. Sigh… I know I am going to receive the same type of criticism with my own book and am trying to be as thorough as I can. A minor frustration I had with this method/layout of the book is that many of the juicy scrumptious scraps that Little provides for us covering so many great personalities and places (in order to prove or bolster one point or another he is making) are spread all over the place. I sometimes felt like bundling bits of this information or that together in order to paint my own picture. Indeed I actually took some notes because just as I thought I would – I learned a lot of things from Little I did not know – within a subject which I feel I am an expert on. The book seems to lack a general thesis because Little is not attempting to prove any specific point. He is simply trying to impart to the reader a visualization of that time and that world. Regarding sources and anecdotes there is one tidbit that is so intriguing and directly falls into my own research, I find that I may just have to contact Little himself about it because I can’t seem to find any other mention of it anywhere. By illustrating this yummy scrap I showcase the kind of rich meal the reader is treated to in Little’s book: So BL mentions a ship captured by DeGraaf during the battle where he took his famous flagship Neptuno from the governor of Cartegena. Another Spanish ship captured in this scrap called La Paz (Peace) was given to one of DeGraaf’s captains and it says only that he was Captan Michel – which is intriguing enough because DeGraaf had several captains with that first name. Which is it or is it another I didn’t know about with Michel as his surname? But that is not the most intriguing part. Little’s point here is that the towns and citizens of New England were very tolerant of piracy at the time because they were often the beneficiaries. This ship La Paz made it all the way to Boston to have its cargo of pirate loot sold! THIS!!! These kinds of scraps – are why I LOVE this book so much. Now THAT – is research my friends, but I find that I just need more. In Benerson Little’s later book The Golden Age of Piracy: The Truth behind Pirate Myths, we find a contradictory tidbit where Little brings up the fascinating fact that some of our favorite pirates from that time had aliases which makes research even more difficult. Little doesn’t clear things up here, he simply presents the evidence – Fransico Frano could be Francois LeSage and our Captain Michel could be Michel Adresson (NOTE: is this Michiel Adrieszoon? – DeGraaf’s great lieutenant – YES it is). Could this same Captain Michel be Guillaume Mimbrat – an alias used after he was accused of piracy? 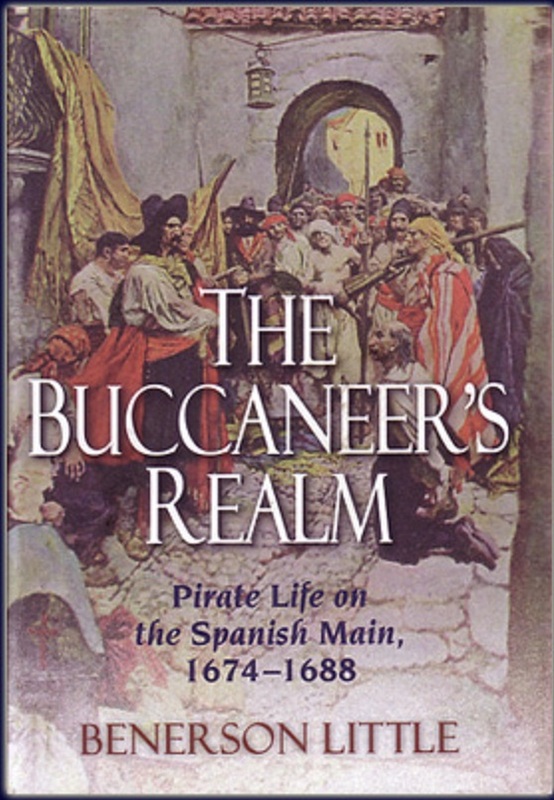 Now here is where we run into the conflict: We read in Buccaneers Realm that Captain Michel took La Paz all the way to Boston to sell off the cargo. But in BL’s later book we find out that Governor Pierre-Paul Tarin de Cussy of Saint-Domingue confiscated La Paz (then named La Mutine(Rascal)), and Andresson then joined LeSage. LeSage is mentioned in other sources as being in several of DeGraafs attacks but he is elusive to historical documentation. However, now I must ask, did the La Paz make it to Boston, or was it confscated the same year (1683) in Santo Domingo? This occurring after they had already sold the cargo off (???) and were returning to the Caribbean to go a-rovin once more – when this pesky colonial governor spoiled all of their fun? I need to find the original sources so I can put some chronology behind this to sift out the facts more completely. Was it taken to Boston AFTER the governor confiscated it by someone else? Little does great research, but like I said, someone like me wants just a tiny bit more. However he gives brilliant clues to follow up on! So my main criticism of this book is in three broad observations in areas which I believe the author didn’t fully consider. As I said before I like this book but in a few areas I think the author failed to look at a few important subjects with the depth they deserve. Some of Little’s chapters are quite short which was a little annoying to me because he tends to make over-reaching assumptions in these places that are based on his opinion and speculation. Generally this is not a problem, especially when we are talking about someone with an already vast knowledge of the subject. In these particular areas though, I think these assumptions and conclusions are not underpinned adequately for him to boldly make the statements he does. I do the same thing myself when I write, but everyone has things they might or might not focus on as passionately. Some would say these details change the overtone of the entire picture a little. I go into some level of detail here to back up my criticism because I think these particular details are important. However for most people my observations will probably simply be considered minutia. First he makes an observation that the galleons we find in the time-frame of the book (1670s/80s) were no longer technically of the actual “Galleon” design. He says that they had been replaced by the new “Fragata” designed ships which were referred to as galleons. He is mostly correct in that the newer design did indeed dominate the scene as far as middling and larger sized ships are concerned. The Dutch retourschip design was the only mid size/large ship type that the Netherlands built (not considering fluyts) throughout the Golden Age and into the next century. In addition they had the smaller “fregat” single decked variety as well which in many ways were simply smaller versions of the retourschip although their function was much more about reconnaissance, speed, privateering and commerce raiding than trading and war. Holland was the largest exporter of ships in the world which sold thousands of vessels (both export merchantmen and warships) to other powers(even their enemies). These ships would have been a commonly seen fixture in the Caribbean. These ships did still have numerous galleon-esque features which is why many naval architects still designate them as part of the Galleon family of ships even now. The English language fails us here because in several other Euro languages, there are more exacting designations for these types of ships. These features which they had in common with the galleon can be easily spotted by someone who has studied ship design, however regardless of this they were definitely of the new “Fragata” design both in the single gun deck and two gun deck (Zweidecker) varieties. The ships that the Petts in England designed and built in the 1630s dominated the scene in English shipyards and became the in vogue vessels that most other English shipwrights copied. These ships (also clearly of the “fragata” type design) most definatly continued to develop and be built throughout the rest of the century and beyond. In Spain, many Flemish shipwrights brought the latest Dutch designs with them and were responsible for producing many Spanish ships. There is no argument that the newer Fragata style design was dominant, however many of the older purely galleon class ships were not only still around, but also still being built. In England, many of the “bark” type ships shared more characteristics with the older pinnaces and race built galleons than they did the newer frigata type ships. In Spain, bulbous Galleon hulled ships continued to be built with semi-open galleries throughout the 17th century and even into the 18th century. The French primarily bought Dutch built ships and mostly followed Dutch practice until the 1660s, however by 1670 the French were building purely French designed ships. Many of these great French ships of the line shared notably more features with the Galleon than the newer Fragata designs. However the mid sized and smaller ships were clearly of the newer design. So one just cannot over-generalize here. The fact is that both ship types still existed all over in the Caribbean at this time and we have good evidence as well of many examples of very aged ships still surviving throughout the centuries before and after. One only need look at Hawkins old Jesus of Lubeck likely built in the 1480s but still fighting hard at the Battle of San Juan de Ulloa in 1568. Also England’s great old capital ship the Sovereign of the Seas was built in 1636 and survived and fought in most of the great battles during the rest of the century. Many more such examples exist which I think we can safely extrapolate to the whole (some over a century old with multiple refits) – even in the tropics. More maintenance was certainly required for Caribbean ships but many went back and forth to Europe regularly and if they were valuable to their owners they would have been maintained as long as possible and economically feasible. I am just adding a little additional paint to the canvas here. Here is an illustration to back up my point. We clearly see a galleon built ship 60 years beyond the period covered in the book. 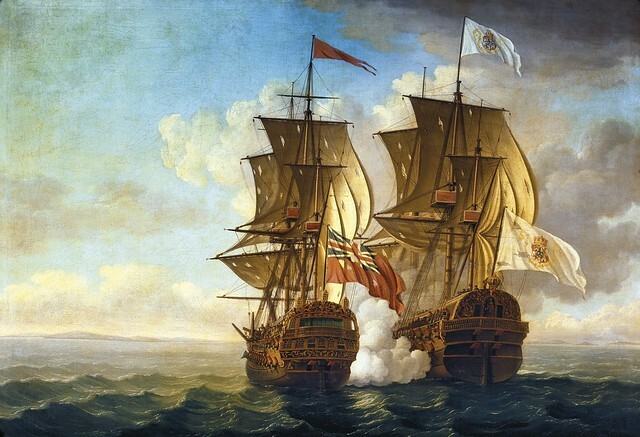 This is the famous action between Anson’s Centurion seizing the “Galleon” Nuestra Senora de la Covadonga in 1742. Even though the upper super-structure of the galleon has clearly been cut down a piece and rounded to fit into contemporary building convention/style of the time, notice the clearly wide bulbous lower hull below with the characteristic flat and even somewhat concave looking notched-back stern. The dramatic difference is evident when comparing her to the Centurion’s stern with her gracefully rounded dove tailed planking curving and running upwards into the sternpost. Secondly, Little paints a picture of slavery that I think is somewhat inaccurate. He mentions slavery and slaves throughout the book as they influenced the subject. He even devotes an entire chapter to the subject of slavery. There is some excellent information here especially considering the grants of Grand Asiento and the monopoly changing hands. I also love a little snippet he provides about a single example of Spanish slave ships actually coming directly to Jamaica at one time to procure slaves. However, Little makes a broad assumption early on in the book that all places in the Caribbean of the Golden Age would have been dominated by these slave populations, but this simply just was not the case. Certainly in English, French and Dutch colonies in the Leeward islands/greater and lesser Antilles where there were cash crops and plantations, this would have been the norm. Even on the Spanish Main this would have been the case in a few places where smuggling was a large problem and where Spanish colonies bordered on Portuguese or Dutch territory. However much of the Spanish Main itself did not have slave populations nearly as large as other places in the Caribbean. One only need make a comparison of the modern towns of Rio de Janiero and Vera Cruz to see what I am talking about. Even after centuries have passed the population compositions are still very telling. An enduring trend before and during this time-frame was a virtual moratorium on trade established by King Phillip in 1580 which forbade any New Spain colony from trading with other nations. A young Francis Drake and seasoned Sir John Hawkins found this out first hand during their 1568 venture in which they had to militantly force trade upon Spanish towns against their will and they subsequently barely escaped with their lives after the ensuing battle of San Juan de Ulua. This incident and these restrictive maritime trading laws were the precursor of the Anglo-Spanish war (1585-1604). England’s trade policy thereafter became one of illegal smuggling into Spanish ports or forceful trading. Historians have labelled the aggressive trading policies in the east during the 19th century as “gunboat diplomacy”, but I would pose that “warship trading” as I will put it, was a very real phenomena during the 17th century in New Spain. As a result the Dutch brazenly and militantly began seizing Spanish territory across the New World, from several of the Leeward islands, to the ABC islands(Curacao), to numerous colonies on the Spanish Main coastline from the Amazon basin to Surinam. Indeed, Brazil was taken by the Dutch for around forty years and the Dutch (as Little does point out) were the primary slave traders of the period with Curacao being the center of that trade in the Caribbean until Jamaica and the English surpassed them in this dark endeavor around 1680. After the Dutch were ousted from Brazil the Portuguese continued with importing massive amounts of slave labor. Many don’t realize that this labor was as much used for mining as it was for tobacco and sugar cultivation. The Native American populations proved to be unable/unwilling to withstand the rigors of mining nearly as well as the hardy African slaves were able. Smuggling of slaves from Dutch Curacao across to the Spanish colonies of Coro and Caracas is well documented and to this day we see large populations of African descent there. However in other Spanish colonies like Vera Cruz, the cities of Panama or San Juan Puerto Rico, African slaves were rarely brought there in large quantities by slavers to begin with or bought and sold in large quantities during the time in question. There are a couple of very simple reasons for this. From the very beginning of Spanish settlement, both moralistic and trade centered laws were enacted which limited the practice of slave importation and at the same time authorized Spanish land owners to subjugate the native American populations. (NOTE: the Spaniards outperformed all other nations when it came to trade legalities. Ships sometimes had to sit literally for months [both leaving and coming in to port] with crews and cargo aboard before imperial harbor officials were satisfied enough [with customs certification, inspections, cargo manifests, and bribes], to allow anyone or anything on or off the ship(s). Part of my continuing research for my own books is to illustrate that slave trading into Spanish ports was not profitable for Spanish captains because not only were the licenses difficult to obtain in the first place, but their cargoes were very perishable [many died on the passage] and keeping them aboard ship and taking care of them/feeding them for weeks after they arrived at their destination was not only problematic but would severely eat into any profits). Encomienda allowed the Spaniards to make virtual slaves of the natives on the grounds that they teach them the ways of Catholic Christianity. Encomienda was later abandoned which is a very interesting human rights story in and of itself but beyond the scope of this review. To be brief, a great priest named Las Casas was extremely influential concerning the practice of both Encomienda and slavery (one of the earliest advocates of human rights) and convinced both the holy orders of the church and nobility (including the king) that it was beneath a virtuous Catholic state like Spain to enslave other human beings. This was the practice of infidels – not Christians. Ferdinand and Isabella had had a similar attitude at the end of the prior century and this is why Encomienda held the verbiage of instruction in Christianity. Their high morals gave way to a realization that the great stone cities they envisioned would never come about unless slaves built them. So in 1501 they allowed a charter to be enacted which authorized a large amount of slaves to be procured and imported for that purpose. These slaves not only built the great Spanish cities of the new world, but in an almost unprecedented policy were also trained as soldiers in order to garrison these places. However after this early period, slavery in New Spain sharply declined moving into the 17th century. This was because of four primary influencing factors: 1. The great cities being mostly completed, 2. Large increases in the Iberian/Spanish population both in births and incoming colonists. 3. the LasCasas reforms, 4. the first slave revolt in colonial America outside of Vera Cruz starting in 1570 and ending in 1618. This revolt is unprecedented and quite simply extraordinary. Interestingly enough, this revolt was led by a former African prince named Gaspar Yanga. Many of the slaves who had been trained as soldiers – well equipped and armed, moving in concert with their brothers who were used as chattel slaves, all rose up together and took to the mountains north of Vera Cruz. This was only two years after the famous battle had occurred with John Hawkins and Drake a short distance away in the harbor of San Juan de Ulloa. Some of these black soldiers were very probably called up to assist and were likely among the reinforcements brought into the harbor after Hawkins had already seized the fort and garrison there. In an almost Sparticus-like episode, it is extraordinary that these free slaves not only defeated or at least frustrated Spanish military attempts to subdue them, but also built their own town in the mountains. This is the first example of a free African settlement in the new world and it is an area of scholarship that I believe is somewhat neglected. They must have become tolerated after a time because of the remote locations. Its possible that some kind of trading was established in some sense. Their numbers continue to rise as additional slaves escaped to find them over the course of the next forty years. One can only guess that hostilities and raiding continued on both side for decades because the newly appointed Viceroy Rodrigo Pachero in 1618 decided to negotiate with the slaves and they were finally granted recognition and autonomy by Spain at that time. Fifty years is a long time and it says amazing things about the tenacity, cohesiveness and organization of this group to have withstood so much for so long. There are many recorded groups of slaves that escaped to remote or abandoned places in the Caribbean at later dates. We call these people Maroons now, but the actions of Yanga predate them all. The name given in 1632 of their granted free autonomous region/town was San Lorenzo de las Negros. Today the region is called Yanga in honor of its founder. So one can only imagine what this event did to further curb slave trading into Vera Cruz and many other Spanish colonial ports thereafter. As Encomienda was gradually rescinded further laws governing human labor practices were put into place called Repartimiento. These laws were more feudal in nature and called upon labor when needed. They also often required wages to be payed in some fashion to the enslaved and this might have made import of black slaves more desirable. However consider that throughout this age, slaves were not cheap nor was it a cheap endeavor to maintain them in a healthy environment that would ensure a return on the investment. In places where large agricultural bases did not exist or there were not large cash crops as a major part of the local/regional economies, it didn’t make sense to import black slave labor into these places. We know that black slaves were still sold in these Spanish cities after the revolt – although I am certain that arming them and training them as soldiers probably became much less of a practice as a result of the events of the preceding decades. However I am almost certain, most black slaves at this particular time were brought into New Spain via war. Spanish trade law allowed the legitimate sale of slaves from colonies or ships which had been seized from the enemy as spoils of war. So indeed there were a sizeable amount of African slaves sold and who populated these towns on the Spanish Main and the greater islands – however, not nearly proportionately as great in numbers as were brought into the other European nation’s Caribbean colonies which openly allowed legal slave trading and quick easy import/export in order to support and maintain a booming plantation/cash crop based economy. Were there times when officials ignored the law and corruption allowed illicit deals? Of course and we know this from accounts of personal black servants who accompanied powerful Spanish merchants, nobles and soldiers from the very beginning of colonization. Corruption was rampant and we know there was a lot of smuggling of slaves going on as well. Think about it, if one were to trade in slaves legally and have one’s ship held from unloading its cargo for weeks in harbor, what were the only other options if one were dealing in slaves? Of course a lot of this changed at the end of the Nine Years War when the post war Assiento law was passed in 1713. This particular Assiento law widely opened up legal trade to other nations/captains other than those who carried Spanish trade licenses. What was the major commodity which was now allowed? – slaves. Which colonial power benefited the most? – Britain, who had become the largest importer and seller of slaves by that time. I realize this is beyond the scope of a book review, but two last tidbits to prove my point on density of slave populations in the different nation’s colonies: 1. Cuba is really the great exception to the rule when it comes to large black populations in a former New Spain colony. Why? Because the largest influx of slaves ever brought into Cuba was from the British in 1720 in order for that colony to quickly maximize sugar production in a suddenly booming, fast growing plantation economy. The majority of modern Cuban blacks are descended from these particular slaves. Assiento law is what allowed this large and unprecedented change in the backdrop which happened decades after the Caribbean we are exploring in The Buccaneers Realm (1670s/80s) 2. I believe if one were to research the matter further, these largely untapped Spanish markets for slaves in these many Spanish cities could be proven to be one of the greedily desired acquisitions (with no tarriffs) that the British mercantilists so wanted when they spurred on the War Hawks to demand that Jenkin’s Ear be revenged. Just speculation mind you. It’s an easy thing to miss in today’s world and I think Little just didn’t fully look into it that much. Details in trade law, and slavery probably are mostly out of scope in a book covering piracy, but I guess I am just trying to change one of the colors a little on Little’s canvas (no puns intended). Going into the 19th century many of these slave laws changed both ways depending on which colony and whose colony we are talking about. Its fascinating when we see Spanish law changing for the worst in many places even though Spain outlawed slavery in 1811. This in a time when British law was abolishing slavery and a greater abolitionist movement was beginning to gain steam in North America. This is really a minor oversight but still important to consider. Little actually briefly mentions repartimiento in Chapter 3 but only in their reference to Native American labor – not on how the regard of and/or use of that labor may have influenced the slave trade or its prohibitions in New Spain. Great Britain abolished slavery in 1806, but their colonies continued to practice it. There was a nasty slave uprising in Barbados in 1816 which was crushed but slavery continued on there until 1834. The massacre at Santo Domingo in 1804 is famous for its brutality and virtually wiped out all whites from Haiti. However, even with all of these developments throughout the 19th century, colonies like Puerto Rico did not abolish slavery until 1873. That is fascinating but no surprise really when we consider that the islands’ slave population was only 3,000 on an island that boasted seven hundred thousand inhabitants at the time. Even a century earlier when the population was MUCH smaller at only about 45,000 people recorded during the census of 1765, it was noted that slaves made up only eleven percent of the total population of Puerto Rico at about 5,000. Brazil however, which had continued to support the largest import of African slaves throughout the age, did not abolish slavery until 1888, and a reversal of the above ratio can be seen in the great cities/colonies where slavery had been allowed from the beginning of the 17th century – and in Portuguese America since the early 16th century – hence why they still have such large black populations today(a large majority in many cities). My last observation on this is not related to the book at all, but I find it both fascinating and ironically amusing that these laws were first began as a form of moral superiority recognizing human rights and that a righteous Catholic power such as Spain should not stoop to slavery and should not enslave indigenous people but only bind them under the yoke in order to “instruct” them in proper Christianity. Slavery was seen by a very devout, spiritual and righteous Queen Isabella as something the Muslim pirates and Barbary coast pirate lords of North Africa indulged in, not good Christian countries. This hypocritical outlook was held long after the rule of law had been ignored or openly broken innumerable times. We see this even in modern media in the movie “The Mission” covering the events surrounding the ceding of Spanish lands to the Portuguese which would then allow slave traders to subdue the peaceful Guarani tribe. This resulted in the Guarani War of 1754-56. (*NOTE: Even with the movie’s historical inaccuracies it is still one of my very favorite movies. MK) The Genizaro are another example of a very hypocritical exception to this but I will not go into that further here. Another interesting side note of consideration is that Asian slaves were also brought into Mexico from the Manila-Acapulco trade route. These people known as Chinos were granted Spanish citizenship in 1672 under the same Spanish Trade/Maritime slavery laws I was referring to above – another area a lot more research is required in but well beyond our scope here – just a small additional consideration. Third point: Benerson Little’s chapter on religion and superstition makes me believe that he himself either doesn’t feel that it is very important to begin with or harbors some kind of a disdain for it. There is a linkage certainly from a purely psychological point of view on how both might effect human behavior, however he does not adequately explore this as a prime motivating factor behind our subject’s actions. Instead he makes a broad brush assumption that pirates weren’t religious people and relied on their wits and courage. I was very disappointed in that simple disregard of this motivational stimulus to the equation – especially since I have devoted a great deal of study in this area for my own unpublished manuscripts/book research in which I cover psychological reasons for motivating actions as a major factor with several distinctly different prevalent flavors/types. In fact if anything, Little proves himself wrong with his own anecdotal examples. He talks about English and Dutch buccaneers openly killing Catholic priests and destroying icons/statues by knocking them down with cutlasses while raiding churches. However he doesn’t consider that it might not be a lack of religion or disregard of the spiritual that is their reason for behaving thus, and could be a strong Calvinist anti-Papist hatred instead, which is religiously motivated in and of itself because of a different dogmatic point of view. I am certain the Dutch zee roovers who were extremely prevalent during this time still resented Spain even though the Dutch state itself had been at peace with them since 1649. Still most of these Dutchmen would have had immediate and certainly secondary family who had perished from fighting or being killed by Spaniards. Early on in their struggle for independence from Spain, whole towns populations were rounded up into their own churches and roasted alive inside when the Spaniards set them afire. Most Dutchmen were very aware of this history even if they hadn’t had a relative killed this way. The atrocities committed throughout the 80 Years War were brutal. Dutch captains and Sea Beggars alike had to sign documents stating that they would execute a policy of “Voetspoeling” when they captured enemy “pirates”. Voetspoeling means literally Foot Washing and it is the precursor of the old pirate lore we know of now as “walking the plank”. All prisoners were to be put overboard to their certain deaths. This was extreme, but they were probably Catholic and killing as many people who believed differently than you did was a major trend in these wars. I cannot prove it yet, but I am fairly certain that the zee roovers brought Voetspoeling with them to the Caribbean of the time as they did so many of their other traditions. Little briefly mentions Huguenots but doesn’t mention anything about them being a majority on Tortuga among the filibustiers and that a large reason they were there – and that the Brethren of the Coast existed in the first place, being because of the massive French Catholic persecutions, massacres and deportation of Protestants – where many of our displaced people here lost close family members and wanted bloody revenge. The wars of religion in Europe were not fully over during our time period either. Certainly the great battles had ended a quarter century earlier, but the Catholic Church started what is now known as the Counter Reformation and this time was in many ways like our modern Cold War with priestly orders infiltrating one another and obtaining massive amounts of power. One only need to look to the Jesuits at this time and to explore Pascal’s Letters to the Jansenists to see what I am talking about. Protestantism and Catholicism were both fighting for the hearts and minds (souls) of the people. This struggle in many ways was directly transplanted into the Caribbean of the time. Little has some excellent anecdotal evidence of prayers aboard French ships. I found one mention quite interesting and amusing in that a cannon salute accompanied the prayer – something I’d never heard before and I continue to learn from Little’s research. I feel like if Little had cared more for this particular subject, he would have taken more time to better research it more deeply because I know personally that there is a lot of rich source material there. Once he leaves religion behind and goes into superstition, I could clearly see his bias. I know many have heard me criticize political correctness and I do indeed hate that. That is not the reason why I was annoyed with Little’s treatment of superstition. It has everything to do with my own views on spirituality and tradition with a high level of respect. Little calls the Shellback ceremony and the Christening of ships superstition. Labeling them thus I believe denigrates them. I suppose some segments of our society would agree and classify them as such, however I do not belong to any such segment and what he labels superstition, I label TRADITION. Tradition is important and I for one am proud that these practices continue in modern times. My own father still proudly tells the story of how he was whipped with sheets of wet canvas as he passed down the line towards the dressed up King Neptune going over the equator as he entered a “polly-wog” and came out a “shell-back” aboard the USS Iowa. I was disappointed also that Little didn’t even cover some of the well known superstitions concerning cats and cauls. This would have been interesting reading and low hanging fruit that many people do not know about. I cannot emphasize enough how important the religious background is to this argument because it drove the men of this time to acts of almost pure madness! It’s one thing to talk about it – blah blah blah – but I’ve always believed that history must be taught using illustrations to enhance any real discussion. History must be visualized to better understand it and if there is one weakness in Little’s book it is a lack of good illustrations. Below exhibited for your consideration are why the Dutch, English and Hugenot pirates from their very beginnings through their subsequent progeny for several generations were such blood thirsty monsters to the Spaniards. Atrocity and hatred has always begat ever higher escalating levels of atrocity and hatred. NOTE: If you are easily disturbed you should not look at the following paintings. 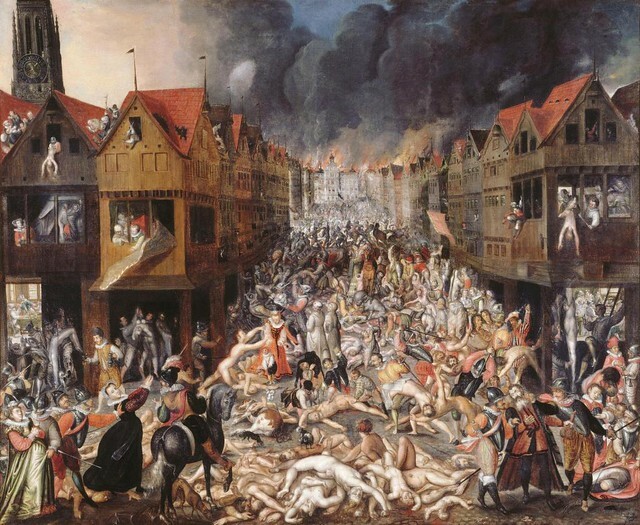 The massacre of the innocents which is a famous religious theme were used by contemporary artists to literally and visually illustrate what the Spanish troops were doing to Dutch towns. 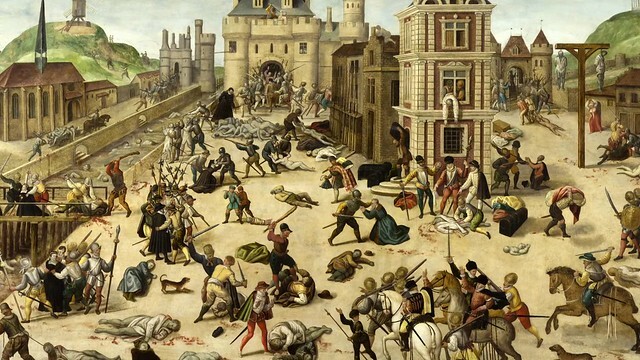 Also in this bunch is the St. Bartholomew Day massacre in Paris where Hugenots and protestants were butchered by the thousands when they came for the Queen’s wedding. The others are sackings and massacres of Antwerp and other Flemish/Dutch towns. I realize that I have written an essay in and of itself to back up my points concerning this Caribbean canvas of the past – our area of study, but I obviously think its important enough to mention here, even though I am still collecting further research on the matter for my own body of knowledge and to incorporate into my own developing manuscripts/unpublished books. Finally I would mention – if you’re looking for a book that’s a quick read and flows naturally, this is probably not the book for you. Benerson Little’s attention to detail and the huge amount of knowledge he treats his audience to, requires the reader to pay attention and stay alert if one wishes to fully and thoroughly digest this impressive bundle of knowledge. If you like short chapters, then you might like to read it incrementally, but you also might just miss out on the overall picture and the great amount of detail if you lack memory skills [like so many of my younger ADHD millennial friends (including my son who will never read this review BTW) do these days.] LOL! If you are a details oriented person and you appreciate the visually rich environments that a truly talented writer can frame, then this book will be a treat for you just as it was for me.